Rachel Tomei/ Staff Photographer Junior midfielder Harrison Weilbacher returned to action Saturday afternoon after missing the team’s first six games due to injury. The Binghamton men’s soccer team talked about set pieces all week in practice leading up to its match against Columbia on Saturday. BU head coach Paul Marco explained to his players what he thought should happen. The Bearcats’ strategy was all set. But barely 11 minutes into the first half, the ball whirred toward the box from the corner flag and bounced around the Bearcats’ defense as if it had been launched from the spring of a pinball machine. It finally settled into the back of the net off a header from the Lions’ senior defender Alex Bangerl. That goal would be the first and final blow in Binghamton’s 1-0 loss to Columbia (3-0-2). It was the Bearcats’ fourth loss in five games. Standing inside the Events Center after the game had ended, Marco tried to explain what happened during the scrum. For the rest of the game, BU’s back line held steady but played aggressively, racking up 13 fouls. Despite allowing just one goal in each of its last two games, Binghamton’s defense has struggled at times, even though it’s one of the more experienced parts of the roster. The Bearcats (2-4-1) have given up 116 shot attempts so far, while their offense has mustered just 74. Redshirt sophomore Alejandro Cubillo has been Binghamton’s starting goalkeeper since last season, but split time with redshirt sophomore Chris Shutler against Columbia. Both goalkeepers logged three saves. Marco said he has been impressed by Cubillo so far this season, but had planned on giving Shutler playing time as well. Down by one goal early in the first half, junior forward Nikos Psarras found the ball at his feet just in front of Columbia junior goalkeeper Dylan Castanheira. But he rifled what would become the Bearcats’ best chance to tie the game straight into Castanheira’s hands. For at least one game, Psarras was kept away from the net. He has propelled the Bearcats’ offense with five goals this season, including four in his last four outings. 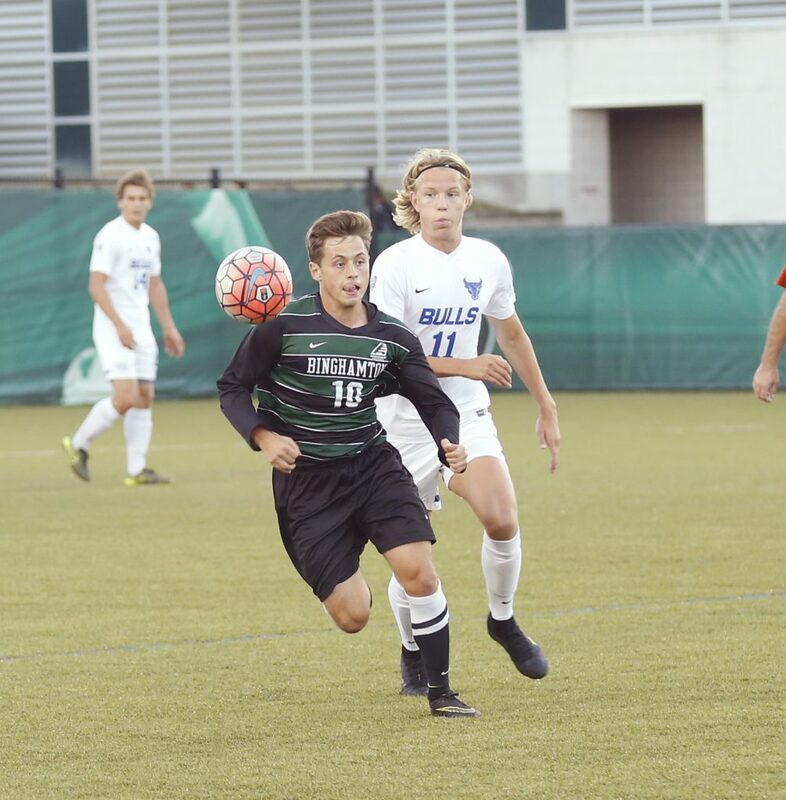 Even freshman Noah Luescher, the Swiss midfielder who Marco has heralded as one of BU’s best young players, struggled to get Binghamton’s offense moving against the Lions’ back line. He recorded two shots; neither were on goal. Both junior midfielder Harrison Weilbacher and junior midfielder Florian Orth returned to the field from lower-body injuries. Weilbacher played the final 18 minutes in his first game of the season, substituting in for Luescher. Marco plans on easing him back into the rotation over the next few games. Binghamton has struggled against Columbia in the past: the Bearcats have played the Lions in four of their last five seasons, losing by one goal each time. Binghamton is set to return to the field on Saturday against Canisius. Kickoff is scheduled for 7 p.m. at the Demske Sports Complex in Buffalo, New York.